Watch any Hollywood films featuring photojournalists and chances are there will be a Domke in there somewhere. I rewatched an old documentary on YouTube recently called 'The Photographers (a film about National Geographic photographers) and all of them were using Domke. I've been using the F-3X for a couple of months now as my every day carry around camera bag and have also recently used it while traveling to the Czech Republic. You can download a free ebook by Jim Domke from the Tiffin website for an interesting and detailed history of the Domke company's beginnings, but here is my very short version. Skip this section if you have no interest in the past. Jim Domke was a staff photographer for the Philadelphia Inquirer back in the '70's. Frustrated by the hard shell camera cases available at the time, which were made for setting down and working out of, rather than working out of while it was on your shoulder. Mr. Domke started using fishing bags, which although offered little to no protection, did allow him to work out of and swap lenses on his cameras. Fishing bags were also soft and adjusted to the shape of the user's body. My first impression of the F-3X was not exactly what I had expected. Having looked at many pictures on the web, I decided to order the Rugged Wear wax canvas version because it looked as though it would become really beat up looking very quickly. I had read various reviews and comments about the wax finish, with some saying it was too waxy (greasy) and some saying theirs had no residue problems. So when mine arrived I was a little disappointed that the wax was indeed a bit too heavy. Nobody wants to get wax all over their hands and then have to handle cameras and lenses. So I left the bag outside, hoping the sun would burn the wax off. The F-3X instantly looked wet. Over time the wax has worn off and I'm sure when I eventually give it a scrub in the shower (Domke recommends this rather than putting it in a washing machine), the wax feel will be gone. A tin of wax is supplied with all Rugged Wear bags, so it can be reapplied if required. I was a little surprised when I first held the lid of the F-3X up to the light. The wax canvas material was much thinner than I had expected. I bought the bag from Amazon and my initial thought was that it might be a fake Domke (to shoot all that fake news). But on closer inspection, I noticed how well made the bag is. The single clip on the front to hold the lid of the bag closed is solid and with a bit of practice is easy to work with one hand. It's not always necessary to use the clip though as the lid also has Velcro. One of the most impressive features in the build quality front is the shoulder strap and handle. The latter is a simple canvas strap that comes in really handy when lifting the bag to and from the passenger seat of a car. It can also be unclimbed and reattached to a couple of D rings on the back of the bag. I think this is to allow the bag to be held onto the handle of rolling luggage. I managed to do this fine while the handle was in its normal position. In my opinion, the handle is a little longer than it needs to be. The shoulder strap is impressive in a few ways. It isn’t noticeable because of the side pockets, but the shoulder strap actually goes around and under the bag, so it is actually supported from the bottom, rather than from the sides. That isn’t the full truth though, because the strap that goes under the bag and the one that hangs from your shoulder are two separate straps. The good news is that they are joined together by really tough plastic attachments. The underside of the strap has two strips of rubber to grip your shoulder and keep the bag from sliding off. This works really well. I also purchased the optional Post Office Pad which has a thick rubber padding and makes a huge difference in comfort when carrying a fully loaded F-3X. Jim Domke copied the shoulder pad used on the bags of US postal workers bags. The only way to really know how good a camera bag is and how well it functions in the field is to use it. So I've carried the F-3X with me every day for the last couple of months, using it for everything except for a couple of shoots where I needed to use more kit that would fit in the Domke. The F-3X has a good amount of pockets for storing all sorts of kit. The hidden one under the main flap is really handy to store cash and passports as it has a zip. I can only guess that this was the pocket Lindsay Addario used to store her passport when she was kidnapped in a war zone a few years ago. Although her kidnappers went through her Domke, they didn't find her passport and she was able to pass herself off as an Italian photographer (rather than an American one). Read Lindsay's great book called 'It's What I Do' for the full story. The front pocket is the large single space variety, rather than sewn up into two smaller ones. It functions well and is good for sunglasses and memory card wallets etc. But it's the side pockets that are the jewel in the crown. Two many bag companies either make the side pockets too tight or forget to include them at all. Not Domke. The side pockets on the F-3X are large enough to carry lenses or water bottles. I bought a pet treats pouch from the local pet store (beats me too), which holds any of my Fuji primes snuggly and with extra padding. A climbing chalk back is basically the same thing. One major flaw of the Domke Shooters Bags is the way they design the top lid and the lids on the side pockets. In both cases, the material is cut too narrow at the end that attaches to the bag. So the side pockets have gaps that rainwater could get in. Likewise, there can be gaps on each side of the top lid unless you take the time to pull each stretch the lid out over the bag. In the case of the lid, unlike other bags that have flat lids, the F-3X is stitched so that it forms a little roof. Like I said, the Domke setup doesn’t protect gear much and has a lot of wasted space too. Although the side dividers are sewn and can’t be removed, they easily fold flat against the sides of the bag leaving one large compartment. So I've been using two different aftermarket camera bag inserts depending on what my needs are. The Dome F-3X with the Hadley Small Insert keeps the bag nice and slim. The centre space holds my X-Pro2 and 35mm f2 attached. The Hadley Small insert (above) was given to me by my friend John Summers and is the same width as the main compartment on the F-3X. I can divide the insert up into three sections and get my X100F, X-Pro2 with the 35/2 attached and X70 with the WCL-X100 underneath. That leaves a bit of space in front of the insert for a book and still leaves all the pockets free for extra lenses and batteries etc. The Koolertron (above) is an insert I bought on Amazon especially for the F-3X that is almost exactly the same size as the main compartment. I also have this one divided up into three compartments. This insert gives a little more room for longer lenses, so I can have my X-100F with the WCL-X100 attached and the X-Pro2 with anything up to the Fuji 90/2 attached. Again this leaves the other pockets for lenses or batteries etc. Click HERE for a link to the Koolertron on Amazon UK. I chose to use the Hadley Small insert for my trip to the Czech Republic. The Koolertron is great for holding lots of kit, but because it’s almost exactly the same size as the main compartment (and fairly rigid), it makes the F-3X a bit boxy and I wanted it to be soft and easy to carry. I wanted it to sit on my hip and mold around me, making it easier to move through crowded spaces and busy public transport. I made the right choice. My Bose QC25 headphones fit in any of the end pockets and the hidden zipper pocket in the lid allows me to put my watch, cash, and passport in there as my bag goes through airport security. I don’t need to worry that someone will grab my cash if I get stopped at security. The rear pocket is ideal for my iPad mini and all the hotel and travel documents that I print out just in case I need them (I also keep digital versions in Evernote). I don't think the Domke is a bag that will attract the attention of thieves. It doesn’t look like, nor is it an expensive bag. 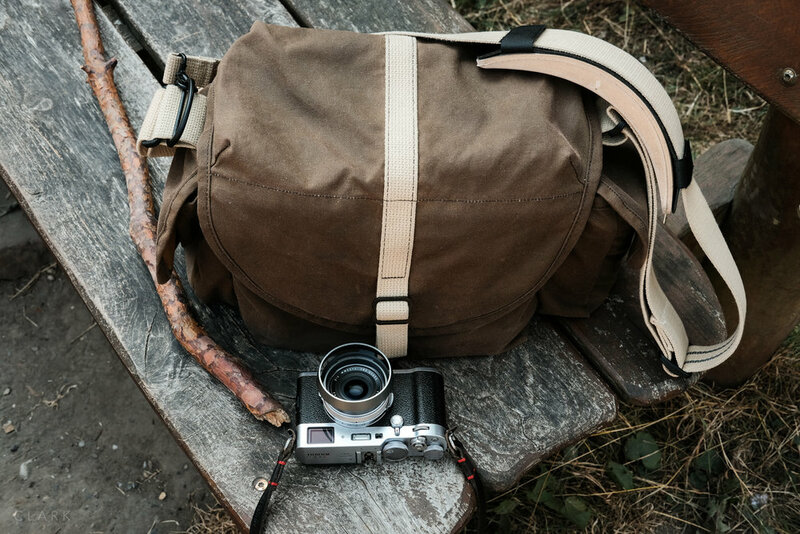 It’s a really functional travel camera bag. Domke bags may not be for everyone. Even if you like Domke, the Rugged Wear version may not be for you. I would say it's best to see them in the flesh at a proper camera store (if you can find one of those). The F-3X is a winner for me and I'll be using it a lot. This bag was never meant to be my every day carry around bag, so I'll be going back to my ONA Bowery for that. But my Domke is so versatile I can see this as my go-to bag of choice for a number of situations. Like ONA bags, the Domke bags just get better looking after lots of use and abuse. I can't think of a better camera bag for traveling either. My F-3X already looks as though it has been on the road for a long time. Maybe I'll do a follow up to this when it starts to get really frayed at the edges and has a few battle scars. You can find the F-3X at the Tiffen website HERE.